Etiology unknown; may be inflammatory or immune-mediated mechanism. 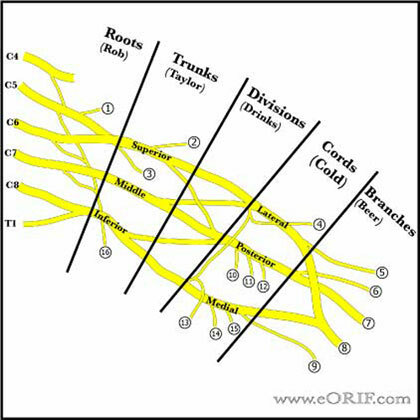 Brachial plexus is formed from C5, C6, C7, C8, and T1 nerve roots. There may be contributions from C4, and T2. A plexus with contributions from C4 is called “prefixed.” (28% to 62%). "Postfixed" = contributions from T2 (16% to 73%). (Kerr AT, Am J Anat 1918;23:285). Roots and trunks are more commonly affected than the divisions, cords, or terminal branches. Trapezius and levator scapulae muscles are almost always intact after traumatic brachial plexus injury allowing for active arm abduction through the scapulothoracic articulation. If serratus anterior function is preserved, forward elevation of the arm through scapular rotation is possible. Preganglionic injury = spinal roots are avulsed from the spinal cord; little potential for recovery. Postganglionic = distal to the dorsal root ganglion; some potential for spontaneous recovery. Avulsion of the T1 root (a pre-ganglionic injury) interrupts the T1 sympathetic ganglion,c ausing Horner's syndrome (miosis (small pupil), enophthalmos (sinking of the orbit), ptosis (lid droop), and anhydrosis (dry eyes). Injury to C5,C6,C7 may result in loss of shoulder flexion, elbow fexion and extension and occasionally wrist and finger extension. Injury to C8 and T1 may limit hand function. Upper trunk = C5,C6 = rhomboids, deltoid, infraspinatus, brachioradialis. Lower trunk = C8 = extensor carpi ulnaris, flexor carpi ulnaris, flexor pollicis longus. Generally associated with a viral prodrome and significant pain. Acute excruciating unilateral shoulder pain, followed by flaccid paralysis of shoulder and parascapular muscles several days later. Varies greatly in presentation and nerve involvement. * Due to the extreme pain involved, patients usually present acutely. 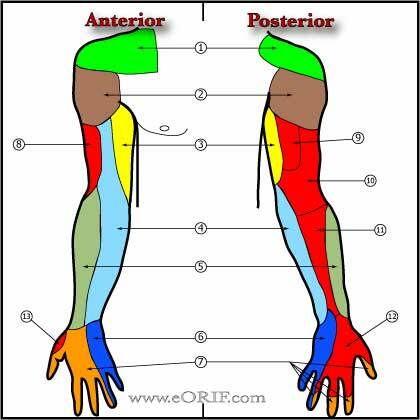 Typically, the affected arm is supported by the uninvolved arm and is held in adduction and internal rotation. Reflexes may be reduced/absent, depending on nerves involved. Sensory loss generally not prominent; may be detectable depending nerves involved (axillary nerve sensation). MRI: consider to rule out other potential diagnoses. EMG/NCV: Consider serial EMG/NCV with repeat physical examination to document and quantify reinnervation or denervation. Fibrillations = denervation. Observation with physical therapy focused on the maintenance of full ROM of the shoulder and other affected joints. PROM and AROM exercises. Consider heat, cold, transcutaneous electrical nerve stimulation as adjunct pain relievers. Follow with serial physical exams +/- EMG/NCV to monitor for improvements and ensure PROM is maintained in affected joints. Consider nerve grafting or tendon transfers if no improvement has occur after 2 years of observation.